Somehow it's reassuring...when art imitates life: Giselle portrays the tale of a young peasant girl who is driven to madness and an untimely death upon discovering that her true love has deceived her. In spite of the betrayal, Giselle, who transcends to an otherworldly forest of beguiled female spirits, protects her remorseful lover from the spirits' evil vengeance. SFBallet performs Giselle as part of their 2008 Season. I shall definitely see you there. The light bulbs always go off when I'm swimming. Today [stroke, stroke, stroke] it dawned on me that each video piece I make is simply a children's storybook. Yes! They are little books to be read--that is, "looked at"--and read again and again or, maybe, not at all. It is an oddly impersonal relationship for the artist and creator. My voice or, what I actually think about the material end, is not necessarily the important thing. 1. The story--the actual detail of grammar, structure, word choice and style--is not all that important, either. [gasp!] Children's stories are NOT like high poetry, where each word, each line break, is painstakingly chosen. These stories are essentially generalized and, even in printed book form, more a general reference than an instruction manual. 2. The story takes second place to the image, to the illustration. 3. Children's storybooks are easily abandoned. How many have been tossed in the sandbox or left to crisp and warp in the sun? One can look at a pretty picture, read a little bit, but wander away. This is not because the end is so predictable, but because it's familiar enough to allow one (guilt free!) to run off to another game. 4. The stories, in this 'go ahead, abandon me' way, invite the reader to invent. Some children might play out the "real" end, while others tweak the tale: she kisses the frog and the frog explodes! Millions of frog fragments, and the spattered slimy rest of him, begin to look like some Jackson Pollack painting...and she, gathering specimens to look at under her microscope, is delighted by this turn of events. Heh, heh, heh. 5. The important voice, in fairy tale or bedtime story, belongs to the reader or listener at that given moment. This is not like reading Hemingway, or Joyce, or Eggers, where one mulls over the meaning and intention of the material, wondering about the author's point of view or objective. Children's stories, timeless as they are, exist most vividly in fleeting instances. 6. The story takes second place to imagination. If my videos are little "image stories," what then, of the music? There are times when I think of the videos themselves as silent music, as silent studies in rhythm. Their "music" is just another layer to the storytelling. Actual audio might complicate the plot. ...USE the correlatives between what you do as a musician/performance artist and acting. Acting is a very practical, dirty, messy sort of art, unlike the structure and notation of music and musical performance. Be aware that it is very difficult, through [physical] expression, to tell what one is doing or thinking. "Does anyone know a bit of music terminology that we use when a minor-key piece ends with--whoa!--a brilliant major chord?" "It's some kind of 'third' ... named after a town in France ..."
"Oh! Oh! The Bordeaux third!" These are the moments for which I live. 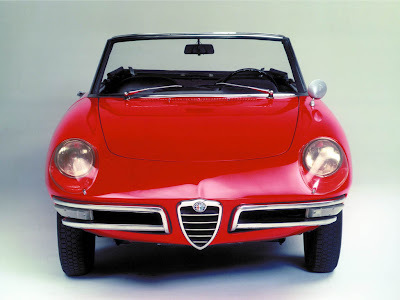 Sitting quietly (a bit bored) at the piano, with one leg over the other's knee, and with my mind occupied in equal parts by grocery lists, measure numbers and key signatures, some recent New Yorker article, a dream of a car ... I couldn't help but giggle. The Bordeaux third. Surrounded on all four sides by my new "string" video at Monkey Town. Indulging in the tastiest bites and in more glasses of wine than one should have (when one is on her own) at Veloce. Standing room (in assigned place #34) Saturday afternoon at the Met. Driving from Princeton to New York in an autumn sunlight infusion for the final performance of The Children's Hour. Eating perfectly cooked and truffled risotto (a slipper-worthy ruby color, courtesy of the lowly beet) at Public. I saw some great art during my trip to New York. In fact, New York being such an art city, I feel rewarded in full. Rewarded for an afternoon given away to diligent practice in a collegiate practice room. And rewarded for the reminder that great art need not be housed in a famous building, on a famous avenue, for a famous fee. I spent midweek in Princeton, working with Anne and, on a whim, I walked over to the Princeton University Art Museum. I skipped over a Warhol Brillo box and slipped past the stares of "historical people" in their awful gilded frames, making a beeline for Fazal Sheikh's exhibit of photographs. I am a weeper for the stark emotional yell of a beautiful black and white photo, whether scenic or a portrait. And here I was rewarded. The portraits are stunning and arranged in ways that make you think; the juxtaposition of images is sometimes fluid and sometimes thought provoking. But I also liked the still scenes, a tiny monkey on a stone wall, and also the hands. Sheikh studies hands as if they are birds (which, of course, you know they are) and birds as if they are the souls and reincarnations of women. The work is political, too, and yet that is simply a layer to, and not the reason for, the emotional impact of the exhibit. So I award my New York prize for best art to Sheikh and the exhibit at Princeton. Kind of funny, eh? 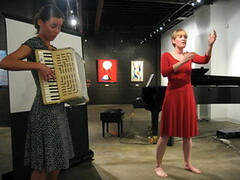 Sidecar presented the final performance of The Children's Hour last night at Gallerie Icosahedron in New York. 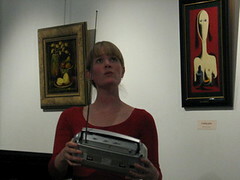 Anne sings "To the Little Radio"
Heather at the helm. And now that the gig is over, I have two and a half days to have fun in the city! So off I go! Um. Yeah. I gotta go practice. Now. Silence is deafening. (Even more than motos.) It's true, and I've decided that I do not like it, not one bit. Silence avoids sense. Silence avoids meaning. Music creates meaning. Music separates the sense from the nonsense. Silence drives me to craziness, sometimes, to impulsive, foolish behaviors. I blame Cage. I blame him for allowing the modern ear to think silence is music, to think silence speaks, to think silence is beauty and truth. Oh, John...did you not hear enough Bach as a child, did you not? The Smiths, "William It Was Really Nothing"
"Leavin' on a Jet Plane"
Coleman Hawkins, "Wherever There's a Will, Baby"
I am a writer and classically trained pianist. I like Mahler, vintage Samsonite, and science fiction films. 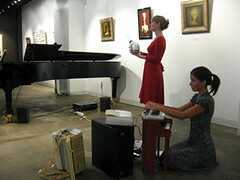 United States, California, Oakland, English, Heather, creative-experimental-classical music, piano, performance, the art song.